The Original PurpleTraveller....: The never ending road. Today was a big day. We had to traverse two mountain ranges with a high plain of about 1000 metres in between. A total distance of about 95 miles. We had a headwind and it was still blazing heat. 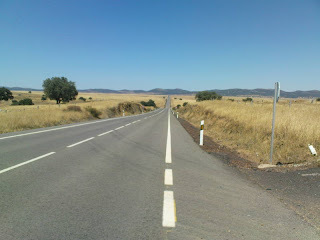 The road ahead was a straight line heading into a vanishing point. It was to hot to stop and there was no shade to enable us to get out of the sun. Dave has decided to stay with us for one more day before going back to the UK. He says that he is concerned about leaving us because of the extreme heat- but then Dave does worry anyway. We are now past Cuidad Real. We managed 12.47 mph and that was really hard going. When I looked at the map of Spain I couldnt believe how much further we still have to do before we get to France. I cannot remember whose original idea it was to cycle back to the UK from Gibraltar but at the moment it feels like madness and I am blaming JD. Tomorrow we will continue the torture- but none of us would miss this for the world. I can't wait to read a more detailed account and see lots of pictures. Keep the rubber on the road! More and more and more. .